The world was astonished to see her co-found an organisation for the social welfare, at the early age of 13. As the White House said, she "is a dynamic, passionate and ambitious young woman committed to creating big change everywhere she goes." You will be fascinated by her principles and the way she leads her life! Read on..
Erin Schrode, 24, co-founder of Turning Green, is working towards a big vision of a greener earth from the past eleven years. If you ever meet her, you will see that her cosmetics, clothes and every part of her daily use products are eco-friendly. “It is essential to walk your talk. I live a normal life, but with an eco filter” she says. Erin grew up in Marin County, California, which is not only a place for a good view, but a place of good people with many environmentalists and social activists. While she grew up there, she never knew that the world outside did not have an environment like hers. She would feel that all kids went to school by carpooling like herself. She felt that all parents follow their passion, like her father and mother. Although she never realized this was not the norm for everybody, she never took it for granted. She shares, “I am thankful for the environment in which I was brought up. Everyone is the way they are because of their upbringing. My mother instilled in me many beliefs; one Margaret Mead quote she would share with me from a small age is ‘Never doubt that a small group of thoughtful, committed citizens can change the world, indeed it’s the only thing that ever has.’ Optimism is the guiding principle my mother and I follow until today. I am so grateful that I have a woman like her, as a role model, as a best friend and as a cheerleader. My father is a brilliant intellectual who always encouraged me to think, to question and to come to my own conclusions. In middle school, the 3 words we were taught to always remember were respect, responsibility and compassion – and that was true!”. The organization Teens Turning Green was co-founded by Erin when she was 13 - the age when a lot of kids do not even know what social responsibility is. To combat doubts that young people could know the science behind safe or toxic personal care products, they armed themselves with information. “The first thing we did”, she says, “was to align ourselves with really smart people. We all need people who can give us the hard facts, as well as the confidence to believe that our missions are possible. I firmly believe that one must do the homework and get educated on whatever landscape he or she is entering. It is vital to understand what others in the same domain have done, and what could be improved. That’s how we got started”. The team’s integrity proves the success of the organization. 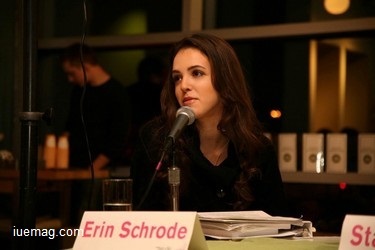 The campaign, originally named ‘Teens for Safe Cosmetics,’ was launched in January 2005, by Erin’s mother and her 13 year old daughter, when news that deleterious chemicals in daily use and beauty products could pose various threats to human health including cancer, asthma, birth defect and many more, enraged everyone. The campaign sought to create awareness about eco responsibility among young minds. 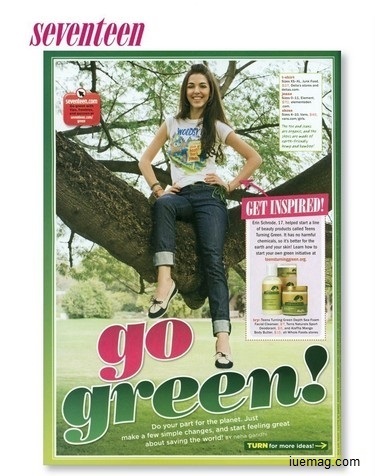 The name was changed to ‘Teens Turning Green’ when the campaign took on other aspects of eco responsible lifestyle too. This led to the beginning of more chapters, collaborations with brands to promote and even co-create safe products, and to explore food service and classroom products at schools. Awareness continued to spread through chapters, programs, events, and rallies. Erin studied abroad for four semesters in university. During one of her semesters, during her stay in Ghana, a classmate who was fascinated by seeing Erin use and speak about eco products reached out to Erin, asking her to share one task involving eco-responsibility that she would try to do – to start. She came back asking for another. This continued and the girl went back home and kept about healthier, more sustainable practices and products, and also shared with people around her. This experience made Erin feel that she could use this idea to bring about a change. “They say it takes 21 days to change a habit, to actually shift the neurological pathways. So, we sought to create a set of tasks for students, every day for one month. We came up with one eco theme per day, ranging from organic food to zero waste to energy to water and more. We felt that a month of action would not just changing that person’s habit, but also affect his or her classmates, friends, family, school, and the surrounding community. We launched the program on the 1st of October, 2011 with no idea as to how many students we would reach. Astonishingly, thousands of students showed up – and came back every day, as their lives began to change. We call it the transition from conventional to conscious. Prizes incentivized action and in the end, twelve finalists were chosen to attend our two-day eco action summit, Green University, in Northern California. Each of them presented about their journey and also had the opportunity to learn from esteemed leaders. Project Green Challenge has continued to grow year after year. We have participants from all around the world including Colombia, India, Russia, Kenya, across the USA, and dozens more.” Erin is passionate as she shares about the conceptualization and implementation of one of the key programs of TG, Project Green Challenge. 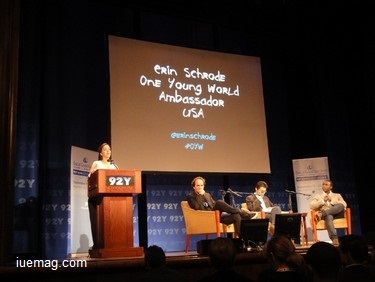 Erin was a also a part of the One Young World Summit in the years 2010, 2011, and 2012, where she got to connect with people who work towards the betterment of the society, from across the globe. She listened and learned from global leaders and social activists like Mohammad Yunus, Desmond Tutu, Kofi Annan and many others. She met real doers who did not just speak about changing the world, but were taking actions. She has since visited a number of friends from various countries like China, Norway, South Africa, India, Tanzania, Colombia and more. “OYW opened my eyes to the power of business to change the world. The co-founder, David Jones, also became a dear friend and mentor” she adds. With a huge experience and network, she got back to her country to implement her learnings and inspire a larger crowd. Speaking and consulting on eco-sustainability and millennials are also some of her interests. She has presented on various subjects at conferences and other events at the White House, United Nations, Disneyland, Unilever HQ, Environmental Protection Agency (EPA), Grameen / Nobel Laureate Professor Yunus' Global Social Business Summit, One Young World, Free the Children, Growing Power and various other forums. Some of the companies she has worked with include Apple, The Coca-Cola Company, Nestlé, Chipotle, Seventh Generation, and Nature's Path. Erin has hands on writing too. “We faced a number of challenges when we began”, she states, “First, you must get people involved in your movement. For these new programs, we wanted to raise awareness and create engagement among doers. We found success in speaking our truth and sharing about specific programs. One can have great ideas, but for that to successfully translate into impact, people must know about it and take action together. Also, in working on sustainability, you must be able to sustain yourself and organization; non-profits need funders to bring to life platforms, events and campaigns. I believe in the power of amazing collaborations; you will all go farther”. The vision continues to push Erin to spread her wings and grow in reach to more countries. Initiatives to create awareness about eco responsible living and problem-solving action has driven Erin’s path and shaped her perspective thus far – and shall lead her to walk many more miles to work towards her goals. “The best way to inspire more people, is to lead by example. I feel such a huge responsibility to live this lifestyle I preach. I am on a journey and will use my time to the best of my ability. YOU can be the change, irrespective of where you are, age, position, fame, or fortune. You can make yourself valuable, even without traditional experience. Life is full of successes, failures, memories, and actions – and that’s beautiful” are her thoughtful messages to the world.